Failed/returned delivery always proves to be a great concern among sellers, with the should-have-been converted sales turning into unnecessary costs to cover. What’s more alarming is that sellers can suddenly find themselves in a shortage of goods to sell when this happens, especially during thriving days like holidays and such. Therefore, accurate analysis of the causes for returned packages is vital to avoid getting tangled up in unwanted situations, and to improve one’s business in the long run. 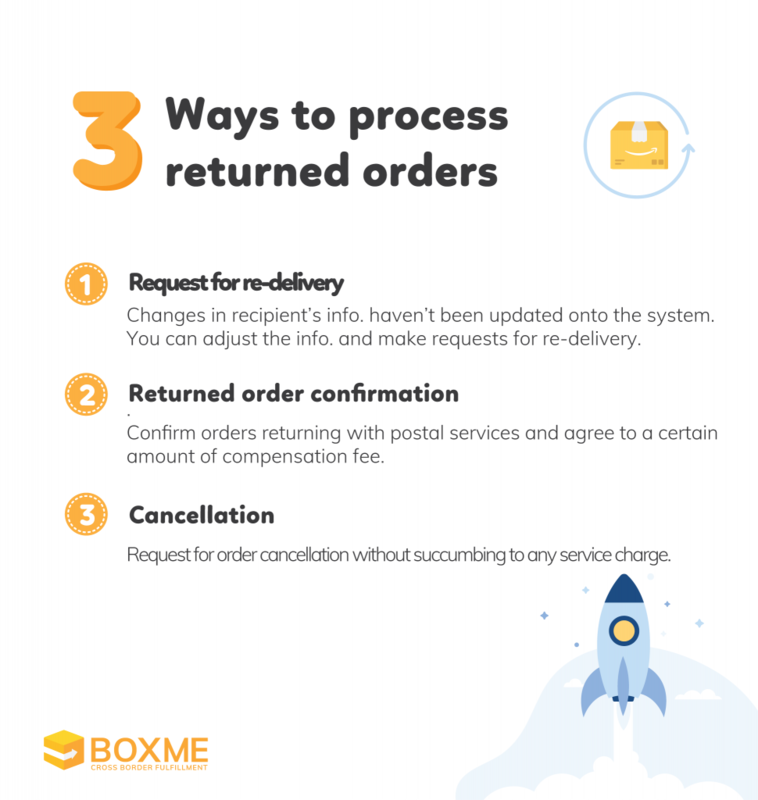 Our robust Boxme system, with the experience of handling more than 300,000 orders each month from thousands of merchant and connected to 8 leading domestic carriers, is proud to be the only system that can help salespeople analyze the reasons for returned orders, and offer efficient transport alternatives to reduce the rate of return as well. For “Recipients reject/cancel deliveries” and “Several failed contacts with buyers” type of reasons, you can randomly monitor different orders from different carriers to check the accuracy of the information reported back by postmen. If it’s “Wrong Address”, you can make a plan to continuously contact buyers before the goods actually arrive at their doorstep to inspect and change recipient information as soon as possible. For “Out of delivery supported area”, you can leverage services from different carriers and choose one appropriately lined for that particular area. Based on these statistics, you can see which areas have a high rate of return comparing to the number of order deliveries allocated in that exact same area. For example, if 20 parcels are shipped backwards out of the total 100 you sent around Hanoi, the rate displayed on the statistics board will be 20%. According to Boxme’s study of major service users, the rate of return only fall into the rank between 8 and 15%; so if in certain provinces the rates are higher, then those are the areas that you as a seller should pay extra attention to. So what exactly can you do on our system to minimize the rate of returned orders to the fullest after having successfully found out what caused them? Make timely contact with carriers when there’s necessary change in recipient’s information. Once your order has been placed and verified, you will not be able to change the initial information on our system, and can only notify carriers directly and ask them to give postmen heads-up. On Boxme system, you can find information related to carriers as soon as you create an order, or you can find what you look for in the order information with policies pertained to each carrier to easily establish contact and fast processing this change. Switch between carriers to compare the rate of returned orders in areas with high rate of return. Boxme system is the only system that connects you with most leading domestic carriers, lets you try and compare the quality and the approximate return rate to choose the carrier that best suits your needs. You can also view each carrier’s policy to learn the specialized routes of each one of them pre-selected. Process returned orders quickly to reduce the overall rate of return. Boxme system provides you with a handful of options to proceed as soon as an order is deemed returned. Those are: Request for re-delivery; Request for return; and Cancellation. With these useful tips, we hope to give you a helping hand in reducing the rate of returned orders and the burden of extra shipping fee, especially during the end-of-the-year shopping festives. Or make direct contact with our sales staff. We are glad to be of service!